Did you know that skin cancer is one of the worlds most common cancers and the number of cases is increasing each year? We all enjoy the great weather and sunbathing but exposure to the damaging ultraviolet (UV) light of the sun can result in permanent skin damage and skin cancer. Sunscreen is a product that you put on your skin to protect it from the sun’s UV rays. 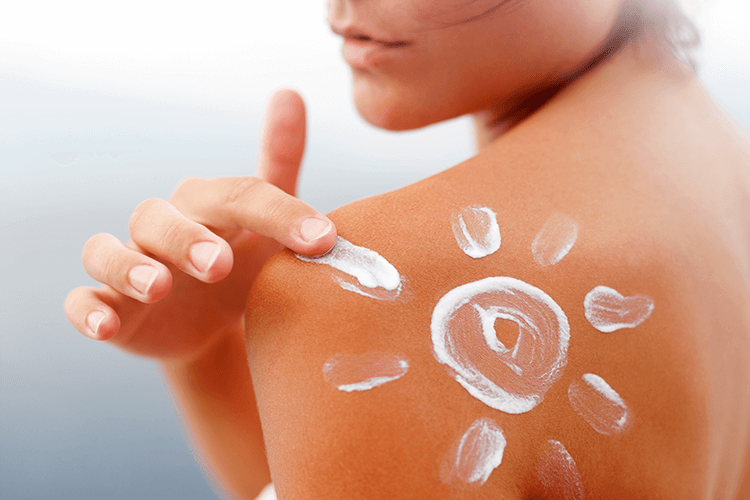 It’s very important to know that sunscreen is only a filter, unfortunately, it does not block all UV rays. Sunscreen should not be used as a way to prolong your time in the sun. Even with the most effective sunscreen, as stated above some UV rays still get through. I recommend that sunscreen should be used as one part of your skin cancer protection plan, especially if staying in the shade and wearing protective clothing isn’t available. Whenever you are out in the sun, you should always wear clothing to cover your skin. Clothes provide different levels of UV protection. Long-sleeved shirts, long pants, or long skirts are always best as they cover the most skin and are the most protective. Dark colors generally provide more protection than light colors. You should technically sunbathe for a maximum of 30 minutes on the first day of your holiday, and extend this by only 5 to 10 minutes a day to avoid any long-term damage. If your skin feels uncomfortable and very hot, it’s time to cover up and seek some shade. If your skin reddens, it means you’ve already had too much exposure and its time to get out of the sun. Don’t forget! If there’s a cool breeze, your skin may burn before it feels hot.